This entry was posted in Recitals on 11/11/2018 by David. 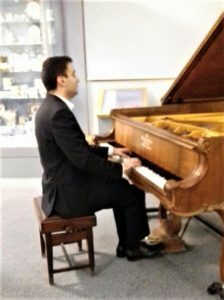 Sunderland Pianoforte Society continued its 76th season with an outstanding recital given by the Romanian pianist Cristian Sandrin who was kindly sponsored by the Countess of Munster Musical Trust. 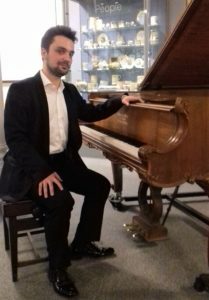 The recital was given in the Pottery Room at Sunderland Museum on Tuesday, 16th October and was well attended by an enthusiastic audience that was well rewarded with an excellent evening. 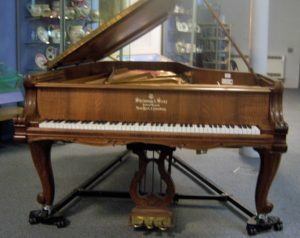 The recital started with the Variations in F minor by Haydn which were followed by the Sonata in D minor op.31 no.2 by Beethoven, both well played, with great attention to detail particularly in the first movement of the Beethoven where the pedal was used correctly as indicated by the composer. The second movement was beautifully played and the third movement was a fitting end to the first half. After the interval we heard Étude pour les Arpèges Composés No. 11 by Debussy, a difficult, rarely played work from a set of 12 piano studies. This was one of the most popular of the set and certainly one of the most difficult, again well played. We then heard the Berceuse, op.57 by Chopin and the evening ended with Kreisleriana op.16 by Schumann which was the highlight of the recital and left the audience demanding an encore. The Chopin Barcarolle was a fitting end to a really enjoyable evening which was appreciated by everyone. Born to a family of musicians from Bucharest, Romania, Cristian Sandrin made his solo debut at the age of 13. After graduating from the Dinu Lipatti Art College he moved to London where he worked with many famous pianists. 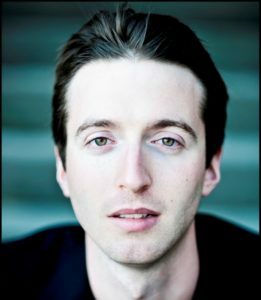 His solo debut in London was at the Wigmore Hall in September 2017. 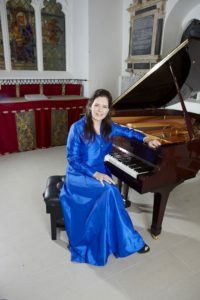 The Society is grateful for the financial help given by the Countess of Munster Musical Trust by making it possible for us to present such a brilliant young pianist who is assured of a successful career. This entry was posted in Recitals, Reviews on 17/10/2018 by David. This entry was posted in Recitals on 03/10/2018 by David. 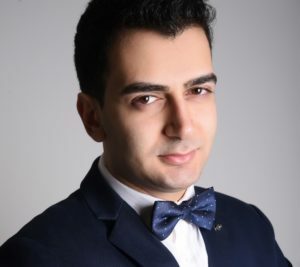 On Tuesday, 25th September Sunderland Pianoforte Society opened its 76th season with a recital given by RIYAD NICOLAS who has just returned from Budapest after winning 1st Prize in the famous LISZT PIANO COMPETITION. This was well attended by an appreciative audience who enjoyed an evening of impressive piano music. The recital began with a thoughtful performance of the Sonata no.31 in A flat major, op.110 by Beethoven which was followed by Schumann’s Fantasiestücke, op. 16, a set of 8 pieces well contrasted in style and beautifully played. After the interval Riyad Nicolas played the Chopin Sonata no. 3 in B minor, and this was a rare performance of attention to detail and perfection which at no time was ever overtaken by his brilliant technique. This was played with thought and sensitivity. We then heard Grandes Études de Paganini No. 6 by Liszt and realised why Riyad had won such a major prize as this very demanding study was played without any effort. This ended the recital but the audience wanted more and were given an encore of Dia Al Succari “Danse de Laila”. 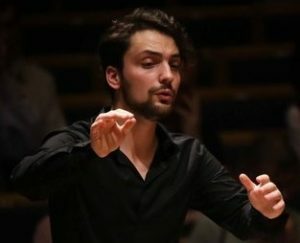 Riyad Nicolas was born in Aleppo, Syria, in 1989 and has already established himself as a highly talented and brilliant pianist who has played in many parts of the world. Besides solo performances Riyad is a keen Chamber Music player. 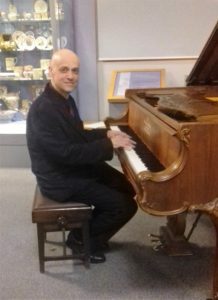 The next recital to be given by the SUNDERLAND PIANOFORTE SOCIETY will be Tuesday, October 16th at 7.15pm in the Pottery room at the Museum. Due to building work in the usual entrance signs will direct the audience through the cafe. This entry was posted in Recitals, Reviews on 27/09/2018 by David. Please note the amendments to the programme in the brochure. Tickets at the door are £12.50. (Free for accompanied children 16 & under; £6.00 for full time students and those on unemployment benefit). It is also possible to purchase a season subscription for 2018-19 at the door, which includes all six concerts for £60. This entry was posted in Recitals on 28/08/2018 by David. Thanks to all the pianists for their contributions to what was a very pleasant and successful evening. This entry was posted in Recitals, Reviews on 16/05/2018 by David. 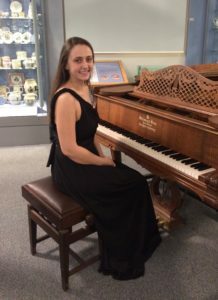 On Tuesday, April 17th Romanian-born Alexandra Vaduva gave a piano recital in the Pottery Room at Sunderland Museum. This was well attended by an enthusiastic audience who could not fail to be impressed by her brilliant but very musical performance which covered a wide range of varied music. The evening began with the Sonata in A minor, D537 by Schubert, well played in great style. The subtle use of pedal in the second movement managed to keep a legato tune whilst keeping the staccato bass. We then heard two Scarlatti Sonatas, E major, K380 and D minor, K9 again very well played. The music then moved to a more modern age of George Enescu (1881-1955) with two pieces from his Suite no.3 which were most pleasant and well contrasted. After the interval there was a beautiful performance of three Intermezzi, Op. 117 by Brahms then we returned to Enescu to hear the Suite for Piano no.1 in G minor op. 3. This is a four movement suite, well contrasted and needing a strong technique as well as musicianship. This work, as with the earlier Enescu, was performed with great authority and power and the Society should feel privileged to be presenting a First Performance [in Sunderland] of such good works. The audience was most impressed with the entire evening and it was gratifying to see how well the Enescu was received. After such a rousing end to the evening Alexandra gave us an encore of Schumann’s “Träumerei”. 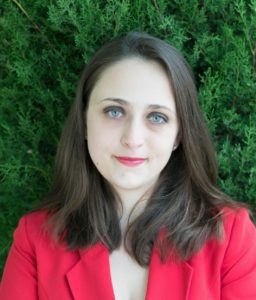 Alexandra Vaduva was sponsored by The Countess of Munster Trust who help young talented artists at the beginning of their career and we certainly hope that we shall hear more of her in the future. This entry was posted in Recitals, Reviews on 19/04/2018 by David. This entry was posted in Recitals on 18/03/2018 by David. This entry was posted in Recitals on 23/02/2018 by David. On Tuesday, February 13th the Society celebrated its 75th anniversary in style with a recital by the brilliant young British pianist Viv McLean who delighted the audience with an appropriate programme for the occasion. Viv was making a welcome return having played on several occasions previously and began the evening with the Variations on “God Save the King” by Beethoven. This was followed by Brahms’ Variations and Fugue on a theme by Handel Op.24, which was played with great authority and power and well appreciated by the audience. After the interval we were treated to a collection of pieces by Chopin starting with the rarely heard Polonaise in C minor Op. 40 No. 2 to be followed by the more gentle Nocturne in G minor Op. 30 No. 1. Then came the famous Scherzo No.2 in B flat minor Op.31, always a favourite with the audience. The Nocturne in E minor, Op. 72 No.1 was followed by a grand performance of the ever popular Polonaise in A flat major, Op. 53 and made a suitable end to the evening, except that the audience were treated to a surprise encore. Viv Mclean gave the first performance of a Polka by composer David Pennycuick which was a good end to the celebrations. Everyone went home very happy after an evening of fine, well performed music and free refreshments in the interval. This entry was posted in Recitals, Reviews on 14/02/2018 by David.